Modulor store, Berlin. Photo by myself. Virgin America is about quality, fun, innovation, challenging assumptions. You can see it in purple aircraft lighting and quirky safety videos. Honda is about affordable quality and trust. You can see it in reliable, albeit generic-looking vehicles, and simple and approachable visual design. Ikea is about cost-consciousness, simplicity and togetherness. You can see it in incredibly affordable furniture, family-oriented stores, and approachable visual design. Building a brand is a long-term commitment which results from thousands of interactions between a customer and the brand’s touch points over time. Startups lack the time to develop this relationship: it’s a race against the clock, and every dollar spent needs to bring the company closer to validation and traction. But users impressions — especially first impressions — matter greatly. How can a startup make the most of its branding efforts for the best results? Here I describe a simple branding exercise I’ve used and evolved with the companies at Expa with success. It can help your team get into alignment and articulate the core attributes of your brand. The output will enable designers to define how it looks, writers to how it speaks, and for any vendor or team member to make coherent decisions by themselves. And it won’t cost you more than two 90-minute sessions and a few dozen sticky-notes. Every brand stakeholder in your company should take part, so if your team fits in a room, get them of all in there. If it’s larger, get the people who’d be expressing the brand day-to-day: designers, marketers, executives, salespeople, recruiters. You can also bring whoever demonstrates interest — you want motivated people brainstorming. In any case, just don’t do this by yourself: you’ll end up with a limited perspective. Once you’ve listed the participants, schedule a 90-minute block for the first session in a room with whiteboards or foam boards. Get plenty of colorful sticky-notes (at least 40 per person) and Sharpies for everyone. Don’t use fine point pens so ideas can later be read from a distance. Snacks could be handy too. For starters, keep in mind (and reinforce with the group) the basic rules of brainstorming: there are no bad ideas, and be additive to other’s ideas. Set a timer for 10 minutes to instill some urgency. 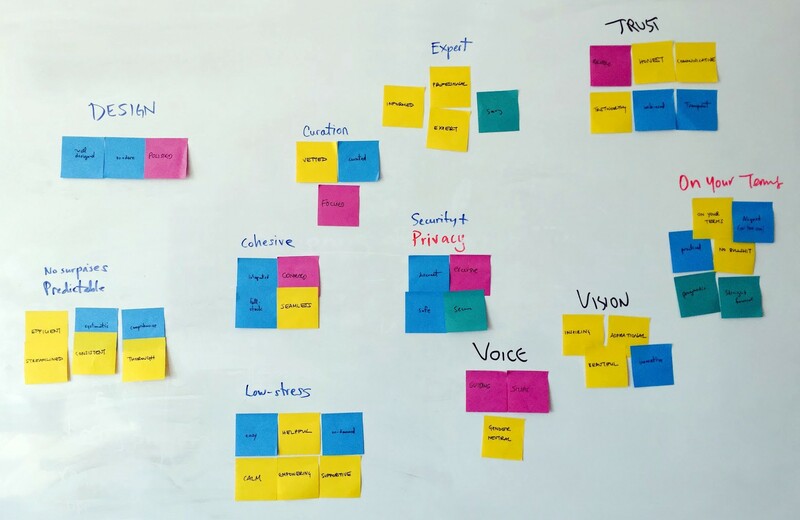 Start writing out random adjectives on stickies, words (simple, exclusive) or short expressions (gender neutral, on your terms) which could be used to describe your brand. As people write down each idea, they should say it out loud and place the sticky on the table, so others can hear it. This lets participants build on each other’s ideas. People will be tempted to stick to “good” adjectives — like smart, professional, etc. Those can be acceptable, but also tend to be generic, which isn’t helpful in differentiating a brand. So try to include controversial or even silly ideas, just to get the discussion going. A few of my favorites are complex, hard, expensive, aggressive, powerful, for dummies, rough. They often cause people to write down the opposing notion — or something in between — , which leads to interesting discussions later on. Throughout this brainstorm, make sure to keep people generative and on topic — no discussion about what works or doesn’t should happen yet. After about 10 minutes, the popcorn might stop popping — ideas might start slowing down. If not, do another 10-minute round. Avoid stopping until after 2 minutes have gone by with no new ideas (the silence can be helpful sometimes). Next, write on opposite sides of the whiteboard, the words Yes and No. As a group, go take every single sticky note and agree on where it should go. yes means “this word could be used to describe our brand”, and no means, uh, no. Since you’re the facilitator, you might want to stand up and do the actual moving of stickies, but everyone’s participation is encouraged. Yes, no, and a tiny bit of maybe. You might notice how the concentration of magenta stickies on the no side. That was my color, and I deliberately suggested ideas which didn’t fit or where simply controversial, to spur discussion. Try to find a close synonym. Sometimes a specific word carries implicit meaning to some people, and replacing it with an equivalent can filter it out. Use an antonym. If it’s clear the opposite of the original word belongs under yes or no, then it’s easier to place the original. Separate the brand from the product. A product might be easy to use, but it doesn’t mean the brand make ease one of its core values. Separate the brand from the customer. Your product might cost $5,000/seat, but it doesn’t mean the company should be perceived as exclusive. Skip it and come back to it later. A word you discuss later might clarify the disagreement about the current one. This process will take quite some time, and you should use all the remaining time in this session to finish this sorting. A few disagreements might remain unresolved, and that’s OK (up to about 5 or 6 adjectives — if you have a large “maybe” group, you probably haven’t gotten to the bottom of it). You should be exhausted at this point, so call it a day. Document your board (photos are great, transcribing each word is ideal) and feel free take down all the stickies, but keep yes and no separate! For the second session, get back to that same room and bring the yes stickies from before. This should also take 90 minutes, but it’s often done in less time. This step is about organizing ideas in groups of emerging patterns, a process also known as clustering or affinity mapping. To get started, spread out all the yes stickies on a table. Presentation. Visual ideas about style, color, light, polish, etc. Tone. Communication-related adjectives such as voice, authoritativeness, friendliness, etc. Personality. Human-like attributes, such as being expert-like, teacher-like, childlike, etc. As well as other groups, mainly about values: abstract, almost philosophical notions — transparent, affordable, innovative, etc. These will probably be unique to your company’s mission or offering. Try to organize all stickies on the board in up to 60 minutes. As groups become clear, write a descriptive name for it on the board (or on a different color sticky), above the adjectives. Once you’re done, your board should look somewhat like this, and you’ll be ready for the last step. 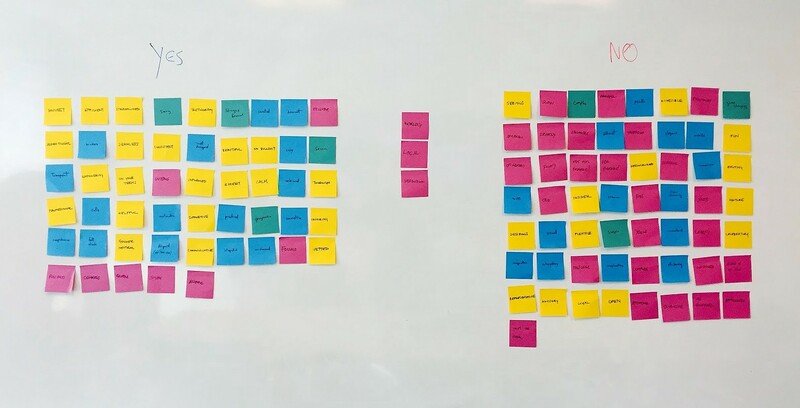 What your affinity map board might end up looking like. Note the different handwriting above each group: everyone is participating. Then take another pass at the resulting list and, try to coalesce each group further. Aim to limit each header to 4 items, to ensure the result is actionable. These attributes by themselves can still be a bit ambiguous. That’s when brand comparisons can be helpful. Try to get at least 15 of these; 30 if possible. And that’s the end of the exercise, you should have now a document which looks roughly like this. It outlines your brand values, shows concrete ways those values present themselves, and anchors your brand relative to others in different spaces. You could work with a branding agency for a richer — and more expensive — process, which could achieve more granular results. But you have little time and money to spend, and this will get you what you need to start establishing a brand. Share that document with a graphic designer, and you can expect logo designs which fit your brand. Work from it with your marketing team, and it will be easy to define what language and tone to use. Hopefully this exercise was useful. If you have any questions, please add them to the comments, or get in touch. You might want to follow me on Twitter.